While many people recover from acne without any permanent effects, some people are left with acne scars that have resulted from their acne. There is considerable variation in types and degrees of acne scars/acne scarring from one person to another but the emotional turmoil this condition causes is shared by all. 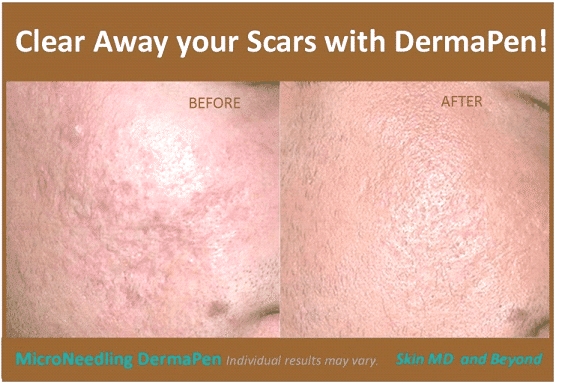 Why choose SKIN MD and Beyond for your Scar Correction Treatments? SKIN MD and Beyond’s longstanding experience in non-surgical cosmetic treatments means that we are the ideal choice if you’re thinking about undergoing scar/ acne scar treatment. Scarring is a physical condition that can have a huge psychological impact. It affects all ages and can destroy self-confidence, affect relationships and even shape the way people live their lives. SKIN MD and Beyond has developed one of the most effective and comprehensive scar treatment programs currently available. Dr. Wright personally assesses each patient’s skin condition through a detailed skin and health history, review of previous treatments and skin examination. She will help assist you in your decision about which treatment will best suit your goals and lifestyle. Due to the large number of treatments available, a consultation will help you decide which best treatment suits you. Overall, there are a number of treatments that are effective in the treatment of scarring. As a rule, the more invasive the procedures will yield better results with fewer treatments, but will require more. Ice Pick Scars – Ice pick scars are narrow, sharp scars that make the skin appear that it has been punctured with an ice pick. They are usually narrower than 2 mm and extend into the deep dermis or subcutaneous layer. They are the most common and a classic sign of acne scarring. Boxcar Scars – Boxcar scars are round to oval depressions that have sharp vertical edges. Unlike ice pick scars they do not taper to a point at the base. Theses angular scars usually occur on the temple and cheeks, and can be either superficial or deep, these are similar to chickenpox scars. Rolling Scars – Rolling scars occur as a result of tethering of otherwise normal-appearing skin to the subcutaneous tissue below. This process gives the skin a rolling or wave-like appearance. Hypertrophic Scars – Hypertrohphic scars develop when the skin produces excess collagen as the injury heals, creating a raised mass of tissue. Keloid scars – where the size of the scar is significantly raised, red/purple, and disproportionate to the size of the initial trauma caused by the acne. Deep divots – these are simply very deep scars that involve loss of subcutaneous tissue volume and result in a large divot. Macular scars – After an acne lesion has healed, it can leave a red or hyper pigmented mark on the skin. This is actually not a scar, but rather a post-inflammatory change. The redness or hyper pigmentation is seen as the skin goes through its healing and remodeling process, which takes approximately 6-12 months. If no more acne lesions develop in that area, the skin can heal normally. Any color change or skin defect still present after 1 year is considered to be a permanent defect or scar. This type of acne scarring is characterized by flat areas of increased and decreased pigmentation or redness as a result of acne. Although there are not any indentations in the skin or raised scars, this is considered as a scar by many patients who have this problem. Microdermabrasion/DermaSweeps are a superficial type of treatment using very fine crystals (microdermabrasion) or Customized bristles ( DermaSweep) to remove the dead outer layer of the skin resulting in a smoother skin surface. The procedure takes 30 minutes and patients can immediately return to regular activity. Only the very surface cells of the skin are removed, so no additional wound is created. These techniques can be helpful with mild acne scarring. Generally, more than 12 treatments are required and the results are usually slight, and certainly a lot less dramatic than the other treatments mentioned above. To learn more click here. Chemical Peels use a chemical solution to burn away the fine outer layers of the skin. These topical preparations including lactic acid, glycolic acid and salicylic acid which act to improve skin surface texture and pigmentation. The solutions are available in several strengths, depending on the degree of peeling desired. Healing can take from 3-7 days until a new, smoother layer of skin is then formed. . Generally, these medium to deep chemical peels are required to achieve a significant result, but a series of more superficial chemical peels could help achieve some improvement in milder acne scarring without significant downtime. To learn more click here. For ice-pick scars, there is a technique called TCA Cross. This involves careful placement of high concentrations chemical called TCA (trichloroacetic acid) into the ice-pick scar. This stimulates the production of new collagen and remodelling of existing collagen to fill in the acne scar. The advantage of this treatment is that it is localized to the problem only and not the unaffected skin. TCA has been used for over 50 years to rejuvenate and repair the skin in a variety of conditions. The CROSS Technique, (Chemical Reconstruction of Skin Scars) using 80-100% TCA, has the advantage of reconstructing acne scars by focusing on the dermal thickening and collagen production that occurs with higher TCA concentrations. Due to the high concentrations of TCA used, this procedure is performed only by Dr. Wright. Local anesthetics or sedation are not needed for CROSS. Mild stinging is usually encountered, easily controlled with an electric fan. An antibiotic ointment is applied to the treated areas after the procedure, and used as needed until crust formation occurs. The skin will be cleansed daily with a non-drying cleanser and moisturized with a moisturizer-sunscreen. The application of mineral based makeup is allowed after CROSS. CROSS is repeated every 4-6 weeks until maximal change is achieved. Repeated CROSS application can help normalize deep rolling and boxcar scars, and deep ice pick scars, but it is likely that other procedures may be included to obtain the most change. The degree of clinical improvement in the original study was proportional to the number of courses of CROSS treatment, with good improvement after three to six courses being recorded in more than 90% of cases. This technique can also treat chicken pox scars and dilated pores, as well as reconstructing depressed surgical scars. About 80% of us have been affected by acne at some time in our lives and acne scarring can be an unsightly reminder of having to deal with that condition. Today, Facial Fillers offers a solution to reduce acne scars by placing filler under the scar to plump up the surface to the level of the skin around the scar. Though this treatment needs to be repeated to maintain the desired effect, the procedure is simple with little discomfort and the results are immediate. Lasers have become the treatment of choice today for acne scars and Skin MD and Beyond is leading the way in offering patients a comprehensive program. To ensure that patients achieve the results they want, Dr. Wright offers multiple laser options to effectively treat these skin texture issues. The microablative or fractional method of resurfacing skin which the ResurFX Laser uses has revolutionized the treatment for acne scars has become the gold standard today. As well, the ResurFX Laser is not only the treatment of choice for acne scars but it is also able to treat a wide variety of skin conditions such as wrinkles, skin laxity, and photo damage. This laser works by smoothing the scar ridges and encouraging collagen growth beneath the scar. The ResurFX laser uses the latest technology in skin resurfacing by treating the skin with microbeams of laser light. Because these microbeams only target a pin-dot size of skin tissue at a time, the untouched skin surrounding the treated skin protects the integrity of the epidermis and healing occurs quite quickly. In the past, traditional full resurfacing (ablative) techniques would peel down to a 120 micron depth of skin. As a result, the skin would become red, swollen, and weepy and patients are off of work for a minimum of a week, and the redness frequently would persist for 1-2 months. In today’s busy world, most people cannot stay away from work for the week and cannot tolerate one to two months of redness. The new Micro Laser Peel treatment is another new addition to today’s anti-aging arsenal as well as scar treatment. Micro laser resurfacing treatments, are microablative treatments specifically designed to peel the skin layer by layer, allowing Dr. Wright to control the depth of skin removed. Each level (20-50 microns) provides a different end result, adjustable to fit the lifestyle needs and end desires of the patient. In comparison, microdermabrasion and glycolic peels, typically performed by an esthetician, are an ideal “polishing” procedure which can reach a depth of 10-15 microns. Because Micro Laser Peels are a “weekend” skin peel which goes deeper into the epidermis, it isthe perfect “next step-up” from Microdermabrasions and Chemical Peels. To learn and find out why SKIN MD and Beyond is recognized as a national expert with the Whisper Micro Laser Peel, watch Dr. Wright in a live demonstration on the televised show ABC American Health Front. Click Here. The healing process varies from patient to patient but will generally take from two to four days. The procedure can be performed on Thursday or Friday and you can return to work the following Monday. Immediately following the procedure you will feel as if you havea bad sunburn. You will have minor sloughing and itchiness the following day. By day two, redness will begin to fade and by day three any redness can be easily covered by makeup. DermaPen therapy provides advanced micro-medical skin needling. It is a procedure that stimulates the skin to regenerate and repair itself naturally and safely creating smoother, brighter, healthier and younger looking skin. The fine needles on an oscillation platform and will penetrate into the skin tissue, below the outer stratum corneum layer of the epidermis. In this living tissue there is a target area of epithelial cells, blood supply, nerve cells, extra cellular matrix collagen, elastin and fibroblasts that all produce and repair certain parts of the body. By causing a trauma to the skin it creates a wound healing response within the dermis and this will encourage new collagen in the areas that are treated. Most people are suitable for the DermaPen treatment, including all skin types. Dr. Wright recommends that patients have 3 procedures approximately 6-8 weeks of each other. For deep acne scarring it may be necessary that the client has up to 6 treatments. It can take up to 6 weeks before visible results can be seen. Pigmentation and vascular changes are a result of inflammation caused from acne and Photofacial is an ideal treatment to decrease these red and brown discolorations. PhotoFacial uses multiple wavelengths of light to gently remodel the collagen and is used to eliminate superficial skin color irregularities. This treatment is best suited for flat (macular) scars where the main problem is pigmentation changes rather than changes in the skin texture. In many cases, it is important to ensure that any active acne is under control prior to treating acne scarring, as the changes to the skin caused by acne can persist for a long time. Scars from accidents or surgical procedures can be painful visual reminders of what you went through as well as being disfiguring. A series of ResurFX fractional laser treatments can help soften and minimize the appearance of these scars. Unlike other lasers, the ResurFX can treat all skin types and tones and works on your entire face: forehead, eyes, nasolabial folds, lip lines, chin and even the neck, chest.